THE CANADIAN PRESS -- NEWMARKET, Ont. -- A 15-year-old boy has been charged with first-degree murder in connection with the death of Constable Garrett Styles. The boy was allegedly behind the wheel of a van with three other teens when he was pulled over by Const. Styles. Police investigating Const. Styles death are also seeking witnesses to help them piece together what went wrong during an early morning traffic stop that ended with Const. Garrett Styles being pinned under a minivan. Officers canvassed motorists Wednesday on the rural highway north of Toronto where Styles' life was cut tragically short. Investigators are hoping to find anyone who saw the 32-year-old Styles stop the van or have interaction with the people in the vehicle. Styles' funeral is planned for Tuesday in Newmarket but tributes have already been pouring in for the married father of a two-year-old daughter and nine-week-old son. Members of the community have placed flowers, cards and teddy bears at the detachment where Styles was based, while some signed a book of condolences. Styles' conversation with a police dispatcher after he was injured was published and broadcast by several media outlets. Some people have called the words heartbreaking while others say the exchange should have never been made public. "I've got a van on my waist — I don't know, it hurts," Styles says, his voice measured and calm but clearly in distress, in a call to dispatchers that was archived by the scanner website RadioReference.com. "Will somebody get this off me, please?" During the call, the dispatcher tries several times to reassure Styles, telling him help is on the way. "I know you're having a hard time breathing. Just keep talking to us. Garrett, talk to me, OK?" the dispatcher says, the emotion mounting in her voice. "I'm trying. I'm trying," comes the desperate reply. Styles stopped the van just before dawn on a rural highway north of Toronto, and was standing at the driver's door when the vehicle accelerated, dragging the officer for some 300 metres and trapping him underneath it. Styles died in hospital about an hour after firefighters freed him. The driver remains in Toronto's Hospital for Sick Children with serious injuries. The hospital declined comment on his condition, saying the case is under police investigation. Styles, who was to celebrate his 33rd birthday Sunday, came from a policing family. 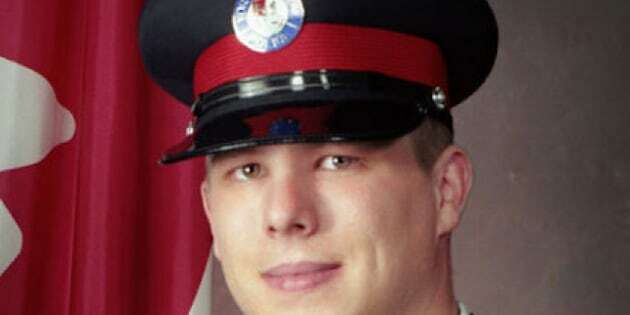 His father, Gary, retired in January after a three-decade career with York Regional Police. His wife, Melissa, is a civilian employee with the force. The officer joined the police force seven years ago and was on his way to becoming a staff sergeant.